On Wednesday, August 8, we had our very first #NonClinicalChats session on YouTube Live! 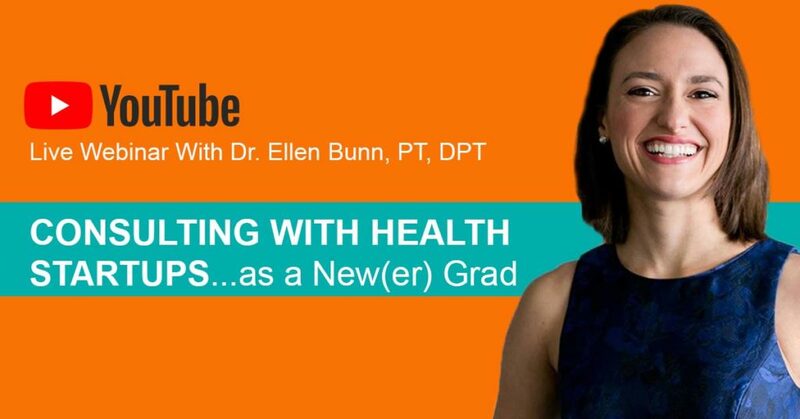 I chatted with Dr. Ellen Bunn, PT, DPT about her experience with healthcare startup consulting, as she already works with several tech startups—and is still technically considered a new grad! Not only is Ellen the Clinical Program Manager at Physera, a rising telehealth physical therapy company, she is also the VP of Operations at Digital Health Forward, an organization devoted to connecting healthcare startups with the right key opinion leaders in the healthcare world. Here are some of the takeaways from our chat. Please note that this only scratches the surface. For the full effect, be sure to watch the video! When you’re somewhat green, it’s all about who you know. That’s why putting yourself out there and networking like crazy is the most important thing you can do. Take advantage of the local healthcare startup scene, and attend local networking groups for entrepreneurs. Bring business cards and explain your desire to take your education and experience into a setting where you can be on the forefront of technology. Ellen mentions using a skills section in her resume, which is wise. A traditional chronological resume works great for traditional patient care jobs, but startup hiring managers care about your transferrable skills. As Donna Lampke, PT, DPT, CPRW, ACRW (of DIY Career Documents) points out, a hybrid resume is best to showcase both your employment history and your functional skills that can transfer well to your new role. Consider premium. You can use the LinkedIn premium section, which allows you to reach out directly to companies and offer your consulting services. Update your title. Update your title to “Digital Health Consultant,” but leave your name with your license and degree, as that adds to your value. You could accept a 1099 role and go with the status quo. But if your skillset is beyond the advertisement, speak up. That’s what Ellen Bunn did, and that’s how she went from a 1099 consulting role to VP of Strategic Partnerships. Then, her ability to organize and create structure quickly advanced her to VP of Operations. These are just the highlights from our very first #NonClinicalChats webinar! For the full experience, take a look at the full video!